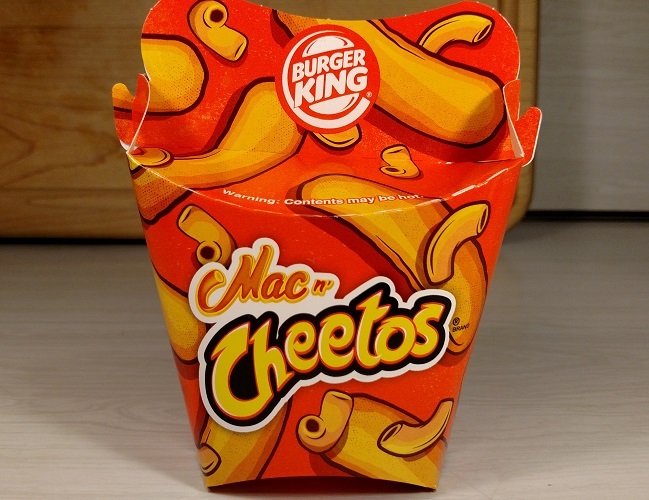 I recently read a piece on the new Mac n’ Cheetos product launched this summer by Burger King. I am sure that the thought of hot mac and cheese available in small portable bites is appealing to a huge segment of the population; it does present an alternative to the ubiquitous french fry as a fast food snack. But there was something about the packaging I had to check out because I just plain love a good package, wherever it shows up. So off I went to our local BK to see just how it worked. Structurally I love this little container. It very simply but solidly encloses the product so there is no spillage into the bag, and I assume, to also retain enough heat to keep it warm until you can partake. It fits comfortably in your hand, in your car’s drink holder, but also stands upright with great stability. The carton opens and re-closes easily if you wish to save some for later (although I find that hard to believe) and integrates two arced perforations into the structure in case the consumer elects to remove the handled upper portion of the container. With only two glue flaps to seal the entire carton it has surprising depth, achieving great economy. (An aside, I think an adapted form of this package would be great for french fries so consumers never have to deal with fishing loose, cold fries out of the bottom of the bag). The graphic design on the package is built on an overall wallpaper design composed of simple posterized line illustrations of a “Maceeto” (that is my word) and macaroni shells against what is suggested as the official Cheetos yellow package color. Anyone would get the macaroni part of the design, but I am not so sure that the “Maceeto” doesn’t look like a cocktail weenie as opposed to a huge Cheeto crammed full of hot and juicy mac and cheese. Cheetos branding is front and center in the facing panel of the carton, cobranding with the Burger King logo in a secondary role on the package handle. Of course this is not a standard package you would find in a retail environment so the graphics are not encumbered with the required disclaimers, content and nutrition data you find on packaged goods, however from a creative standpoint, the concept of the package seems to me to have strong application within the consumer packaged goods arena, for products such as cookies, pasta or grains. This is not a consumer product in the strictest sense of the word – it is a hand held carrier for a fast food snack product. What I applaud is its creativity and fresh approach. The use of big bold colors and the engineering of the structure acts as a call to action to think differently in approaching package design and utility. Is this good packaging? It’s packaging that works because the package alone – independent of advertising or promotion– was enough to draw me in and create sufficient interest that I wanted to find out more about it. The purpose of our “findings” blog is to spotlight packaging that displays thinking that breaks the mold and delivers something new or chancy – or at the very least, highlights packaging that catches your eye in the retail environment.